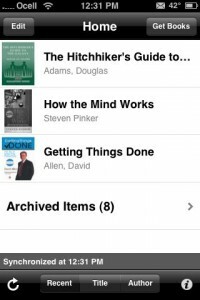 Kindle for iPhone [iTunes link] (The name bugs me, as it works fine on an iPod Touch) is an app from Amazon that lets you retrieve your Kindle purchases from Amazon’s servers and load them onto your device. Along with the content comes your bookmarks and notes generated on the Kindle. Unfortunately,Â you can’t create notes on the mobile device. Other things you can’t do: search, look up word definitions, highlight, and text to speech. Of course Amazon wants to keep the Kindle at the forefront of the Kindle experience. If the iPhone app performed every function the Kindle performed (short of the e-ink display obviously) then I think people would have a much more difficult time justifying the purchase of a nearly $400 Kindle reader. I haven’t had time to do real reading in the application yet, but I’m very impressed with the setup in the few minutes I have played around with it. Getting content from my Amazon Kindle account was absurdly simple. You just go into “Archive” and choose what book you want loaded onto your device. When you’re done, a swipe and tap deletes the content from memory. I HAVE had trouble getting the positioning to sync correctly. I can sync my iPhone’s position in a book to my Kindle, but I can’t get my Kindle’s progress to sync back to the iPhone. Hopefully it’s a simple glitch that will sort itself out soon. I think Amazon has made a really smart move here. The success of Stanza and Classics has proven that mobile device users are interested in having access to novel length content on their mobile devices. 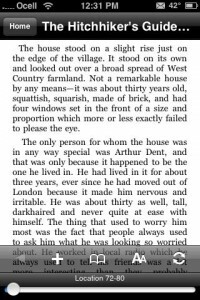 The problem with Stanza and other apps that can read purchased ebooks is the same problem that caused the digital music market to stagnate before iTunes really gained momentum… having a single source to go to for content. Amazon is in a great position to provide such an ecosystem for ebooks. I’m extremely curious to see how many people start using the Kindle store to purchase content for their iPhones, Touches, and whatever mobile devices Amazon releases this software for, without ever owning an actual Kindle ebook reader. I also think the term “Kindle reader” will become more ambiguous as Amazon’s software enables more and more mobile devices to consume the content. 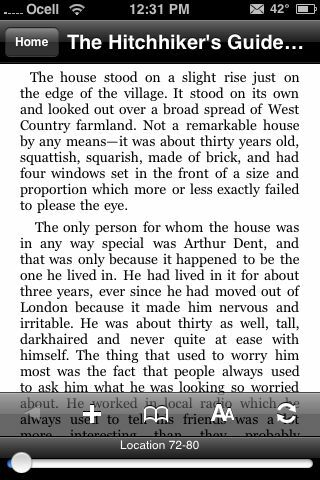 You can read more about the Kindle iPhone/Touch app at MobileCrunch.